You understand what an IOU is. If you are not sure, read the IOU tutorial overview. You have installed the DAML SDK. See Installing the SDK. This loads the entire application into a folder called quickstart. Run cd quickstart to change into the new directory. da.yaml is a DAML project definition file consumed by some CLI commands. It will not be used in this guide. daml contains the DAML code specifying the contract model for the ledger. daml/Tests contains test scenarios for the DAML model. frontend-config.js and ui-backend.conf are configuration files for the Navigator frontend. pom.xml and src/main/java constitute a Java application that provides REST services to interact with the ledger. You will explore these in more detail through the rest of this guide. To run through this guide, you will need to understand what an IOU is. This section describes the properties of an IOU like a bank bill that make it useful as a representation and transfer of value. A bank bill represents a contract between the owner of the bill and its issuer, the central bank. Historically, it is a bearer instrument - it gives anyone who holds it the right to demand a fixed amount of material value, often gold, from the issuer in exchange for the note. I promise to pay the bearer on demand the sum of five pounds. The true value of the note comes from the fact that it physically represents a bearer right that is matched by an obligation on the issuer. The value of a right described in a legal agreement is based on a matching obligation for a counterparty. The British pound note would be worthless if the central bank, as the issuer, did not recognize its obligation to provide a certain amount of gold or silver in exchange for the note. The chief cashier confirms this obligation by signing the note as a delegate for the Bank of England. In general, determining the parties that are involved in a contract is key to understanding its true value. 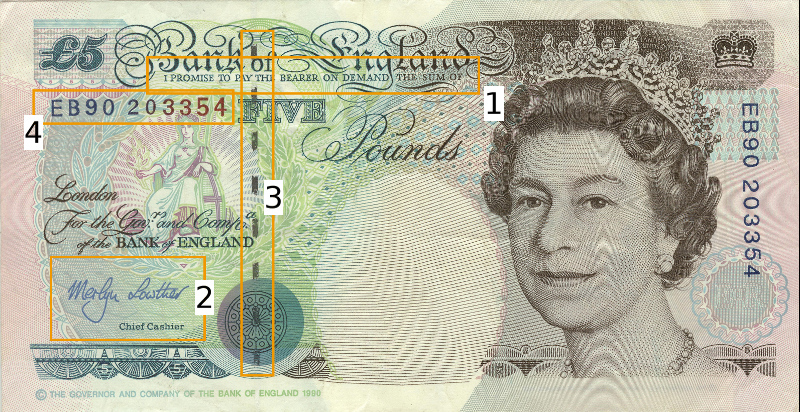 Another feature of the pound note is the security token embedded within the physical paper. It allows the note to be authenticated with limited effort by holding it against a light source. Even a third party can verify the note without requiring explicit confirmation from the issuer that it still acknowledges the associated obligations. Every note has a unique registration number that allows the issuer to track their obligations and detect duplicate bills. Once the issuer has fulfilled the obligations associated with a particular note, duplicates with the same identifier automatically become invalid. The note itself is printed on paper, and its legal owner is the person holding it. The physical form of the note allows the rights associated with it to be transferred to other parties that are not explicitly mentioned in the contract. The sandbox is now running, and you can access its ledger API on port 6865. The parameter --scenario Main:setup loaded the sandbox ledger with some initial data. Only the sandbox has this prototyping feature - it’s not available on the full ledger server. More on scenarios later. Open a new terminal window and navigate to your project directory. The Navigator automatically connects the sandbox. You can access it on port 4000. Go to http://localhost:4000/. This is the Navigator, which you launched earlier. On the login screen, select Alice from the dropdown. This logs you in as Alice. 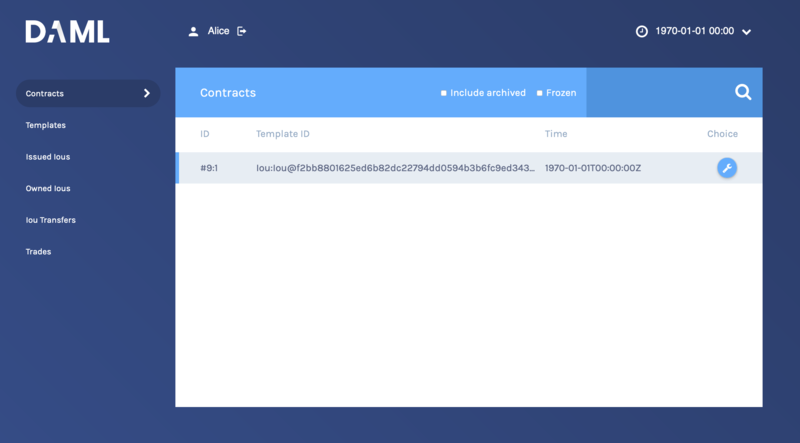 This is showing you what contracts are currently active on the sandbox ledger and visible to Alice. You can see that there is a single such contract, with Id #2:2 , created from a template called Iou.Iou@28b… . Contracts and Templates are standard views, available in any application. The others are created just for this application, specified in the frontend-config.js file. For information on creating custom Navigator views, see Customizable table views. Click Templates to open the Templates page. This displays all available contract templates. Instances of contracts (or just contracts) are created from these templates. The names of the templates are of the format module.template@hash . Including the hash disambiguates templates, even when identical module and template names are used between packages. On the far right, you see the number of contract instances that you can see for each template. Try creating a contract from a template. Issue an Iou to yourself by clicking on the Iou.Iou row, filling it out as shown below and clicking Submit. On the left-hand side, click Issued Ious to go to that page. You can see the Iou you just issued yourself. Now, try transferring this Iou to someone else. Click on your Iou, select Iou_Transfer, enter Bob as the new owner and hit Submit. Go to the Owned Ious page. The screen shows the same contract #2:2 that you already saw on the Contracts page. It is an Iou for €100, issued by EUR_Bank. Go to the Iou Transfers page. It shows the transfer of your recently issued Iou to Bob, but Bob has not accepted the transfer, so it is not settled. This is an important part of DAML: nobody can be forced into owning an Iou, or indeed agreeing to any other contract. They must explicitly consent. You could cancel the transfer by using the IouTransfer_Cancel choice within it, but for this walk-through, leave it alone for the time being. Try asking Bob to exchange your €100 for $110. To do so, you first have to show your Iou to Bob so that he can verify the settlement transaction, should he accept the proposal. Go back to Owned Ious, open the Iou for €100 and click on the button Iou_AddObserver. Submit Bob as the newObserver. Contracts in DAML are immutable, meaning they can not be changed, only created and archived. If you head back to the Owned Ious screen, you can see that the Iou now has a new Contract ID #6:1 . To propose the trade, go to the Templates screen. 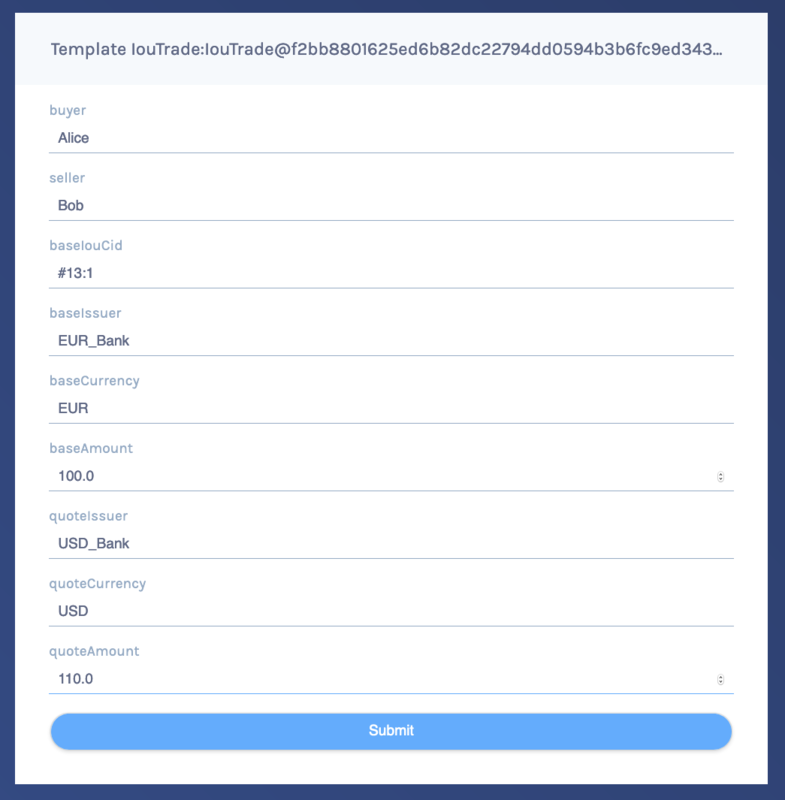 Click on the IouTrade.IouTrade template, fill in the form as shown below and submit the transaction. Go to the Trades page. It shows the just-proposed trade. You are now going to switch user to Bob, so you can accept the trades you have just proposed. Start by clicking on the logout button next to the username, at the top of the screen. On the login page, select Bob from the dropdown. First, accept the transfer of the AliceCoin. Go to the Iou Transfers page, click on the row of the transfer, and click IouTransfer_Accept, then Submit. Go to the Owned Ious page. It now shows the AliceCoin. It also shows an Iou for $110 issued by USD_Bank. This matches the trade proposal you made earlier as Alice. Note its Contract Id #3:2. Settle the trade. Go to the Trades page, and click on the row of the proposal. Accept the trade by clicking IouTrade_Accept. In the popup, enter #3:2 as the quoteIouCid, then click Submit. The two legs of the transfer are now settled atomically in a single transaction. The trade either fails or succeeds as a whole. Privacy is an important feature of DAML. You can check that Alice and Bob’s privacy relative to the Banks was preserved. To do this, log out, then log in as USD_Bank. On the Contracts page, select Include archived. The page now shows all the contracts that USD_Bank has ever known about. An IouTransfer that was part of the scenario during sandbox startup. Bob’s original Iou for $110. The new $110 Iou owned by Alice. This is the only active contract. USD_Bank does not know anything about the trade or the EUR-leg. For more information on privacy, refer to the DA Ledger Model. USD_Bank does know about an intermediate IouTransfer contract that was created and consumed as part of the atomic settlement in the previous step. Since that contract was never active on the ledger, it is not shown in Navigator. You will see how to view a complete transaction graph, including who knows what, in Test using scenarios below. The contract model specifies the possible contracts, as well as the allowed transactions on the ledger, and is written in DAML. For more information about the DA Ledger, consult DA Ledger Model for an in-depth technical description. Take a look at the DAML that specifies the contract model in the quickstart application. The core template is Iou. Open DAML Studio, a DAML IDE based on VS Code, by running da studio from the root of your project. Using the explorer on the left, open daml/Iou.daml. An Iou can only be created if it is authorized by both issuer and owner. The amount needs to be positive. Earlier, as Alice, you authorized the creation of an Iou. The amount was 100.0, and Alice as both issuer and owner, so both conditions were satisfied, and you could successfully create the contract. To see this in action, go back to the Navigator and try to create the same Iou again, but with Bob as owner. It will not work. The Iou_Transfer choice above takes a parameter called newOwner and creates a new IouTransfer contract and returns its ContractId. It is important to know that, by default, choices consume the contract on which they are exercised. Consuming, or archiving, makes the contract no longer active. So the IouTransfer replaces the Iou. A more interesting choice is IouTrade_Accept. To look at it, open IouTrade.daml. This choice uses the === operator from the DAML Standard Library to check pre-conditions. The standard library is imported using import DA.Assert at the top of the module. Then, it composes the Iou_Transfer and IouTransfer_Accept choices to build one big transaction. In this transaction, buyer and seller exchange their Ious atomically, without disclosing the entire transaction to all parties involved. The Issuers of the two Ious, which are involved in the transaction because they are signatories on the Iou and IouTransfer contracts, only get to see the sub-transactions that concern them, as we saw earlier. For a deeper introduction to DAML, consult the DAML Reference. You can check the correct authorization and privacy of a contract model using scenarios: tests that are written in DAML. Scenarios are a linear sequence of transactions that is evaluated using the same consistency, conformance and authorization rules as it would be on the full ledger server or the sandbox ledger. They are integrated into DAML Studio, which can show you the resulting transaction graph, making them a powerful tool to test and troubleshoot the contract model. To take a look at the scenarios in the quickstart application, open daml/Tests/TradeTest.daml in DAML Studio. A scenario test is defined with trade_test = scenario do. The submit function takes a submitting party and a transaction, which is specified the same way as in contract choices. Compare the scenario with the setup scenario in daml/Main.daml. You will see that the scenario you used to initialize the sandbox is an initial segment of the trade_test scenario. The latter adds transactions to perform the trade you performed through Navigator, and a couple of transactions in which expectations are verified. After a short time, the text Scenario results should appear above the test. Click on it to open the visualization of the resulting ledger state. Each row shows a contract on the ledger. The first four columns show which parties know of which contracts. The remaining columns show the data on the contracts. You can see past contracts by checking the “Show archived” box at the top. Clicking the adjacent “Show transaction view” button switches to a view of the entire transaction tree. The submit function used in this scenario tries to perform a transaction and fails if any of the ledger integrity rules are violated. There is also a submitMustFail function, which checks that certain transactions are not possible. This is used in daml/Tests/IouTest.daml, for example, to confirm that the ledger model prevents double spends. A distributed ledger only forms the core of a full DA Platform application. To build automations and integrations around the ledger, the SDK has language bindings for the Ledger API in several programming languages. The application provides REST services on port 8080 to perform basic operations on behalf on Alice. To start the same application on another port, use the command-line parameter -Drestport=PORT. To start it for another party, use -Dparty=PARTY. GET on http://localhost:8080/iou lists all active Ious, and their Ids. Note that the Ids exposed by the REST API are not the ledger contract Ids, but integers. You can open the address in your browser or run curl -X GET http://localhost:8080/iou. GET on http://localhost:8080/iou/ID returns the Iou with Id ID. 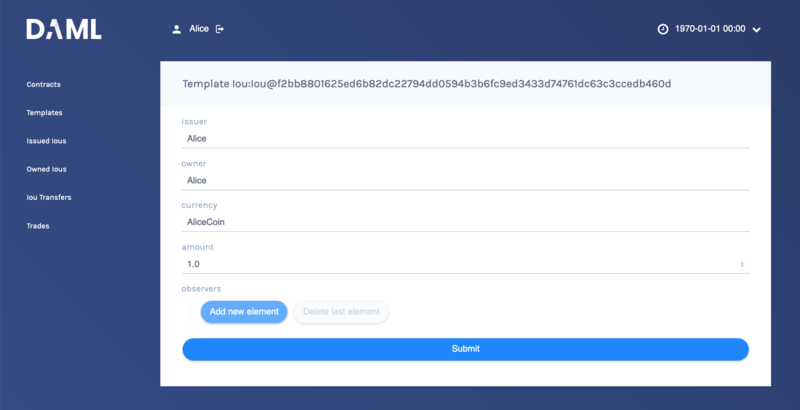 PUT on http://localhost:8080/iou creates a new Iou on the ledger. POST on http://localhost:8080/iou/ID/transfer transfers the Iou with Id ID. to transfer it to Bob. If it’s not 0, just replace the 0 in iou/0 in the above command. It consists of the application in file IouMain.java. It uses the class Iou from Iou.java, which is generated from the DAML model with the Java code generator. The Iou class provides better serialization and de-serialization to JSON via gson. A connection to the ledger is established using a LedgerClient object. An in-memory contract-store is initialized. This is intended to provide a live view of all active contracts, with mappings between ledger and external Ids. The Active Contract Service (ACS) is used to quickly build up the contract-store to a recent state. Note the use of blockingForEach to ensure that the contract store is fully built and the ledger-offset up to which the ACS provides data is known before moving on. The Transaction Service is wired up to update the contract store on occurrences of ArchiveEvent and CreateEvent for Ious. Since getTransactions is called without end offset, it will stream transactions indefinitely, until the application is terminated. Commands are submitted via the Command Submission Service. You can find examples of ExerciseCommand and CreateCommand instantiation in the bodies of the transfer and iou endpoints, respectively. The rest of the application sets up the REST services using Spark Java, and does dynamic package Id detection using the Package Service. The latter is useful during development when package Ids change frequently. For a discussion of ledger application design and architecture, take a look at Application Architecture Guide. Great - you’ve completed the quickstart guide! Explore examples for guidance and inspiration. Learn more about application development. Learn about the conceptual models behind DAML and platform.